Neuralgia is sharp, shocking nerve pain that occurs when a nerve is irritated. It is far more common in elderly people, but it may occur at any age. Treating related disorders such as diabetes and renal insufficiency may help to PREVENT some forms of neuralgia. Pain associated with neuralgia can range from mild to severe. Neuralgia has no clear-cut cause. It is however associated with conditions like Type 1 Diabetes and Multiple Sclerosis. Compounding pharmaceuticals now offer offers a real solution. Most symptoms associated with neuralgia can be treated with the daily application of a compounding creams. Please read Understanding The Different Forms Of Neuralgia if you would like more information on neuralgia. Currently, medications for the treatment of neuralgia are mostly systemic and affect the central nervous system. Patients will often suffer with continued neuropathic pain even AFTER typical medications have been prescribed. Compounding finally promises to break the mold of conventional treatment by changing the way we approach individual patients and their unique symptoms. Compounding dates back to the origins of pharmacy. 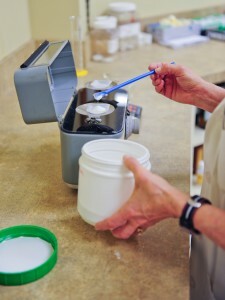 With the help of modern technology and in-depth research, compounding is more popular than ever before. The compounding industry now makes up an estimated 3% of the U.S. prescription market. Compounding is the art of formulating unique medicine from scratch. This means that every patient will receive medication suited to their specific, unique requirements. Conventional methods of treatment mostly prescribe a standard dose of medication for all patients diagnosed by similar conditions, even if their symptoms differ. A customized compound cream will allow you a pain-free future. The topical application of compound creams means localized treatment and virtually zero side effects. Topical pain creams are applied directly to the affected area in order to block pain at the source. Compound creams are so effective, they will eliminate your use for any other medication COMPLETELY. No more pills and potions which promise results but do not deliver. “Millions of people benefit from compounding,” said Jay McEniry, executive director of Patients and Physicians for Rx Access. This cream is made in a pharmacists lab and made to order. Compounding standards are set by the United States Pharmacopeia ( USP ) and are integrated into the day-to-day practice of pharmacy compounding. There is no need to struggle with pain. Use compound cream to avoid the painful symptoms of neuralgia and start living better today. For more information on pain creams, please read Custom Compounding For Chronic Pain Finally Uncovered.